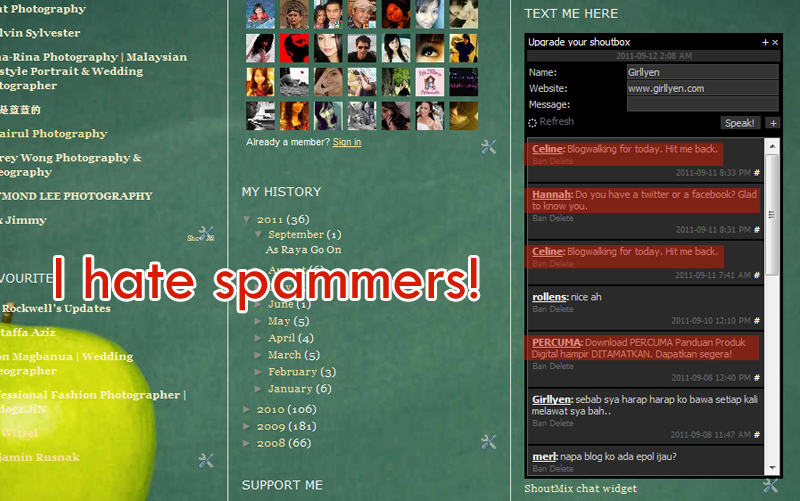 Seriously, I don’t like spammers (those I highlighted in Red), I have to remove the shout box, just drop a comment in the future. Sorry for the inconvenience caused. mana suda shoutbox ko? kenapa teda suda? terpaksa la sa pii tulis di comment post ko kalau sa mo tanya apa2. (lalala.. sambil continue click2 link urang pii comment2 without baca post durang). same goes with me before..i had to really removed the shoutbox! Merl.. terpaksa laa.. hahaha.. ciss.. rajin sikit comment bah..
Fiona..shoutbox pun boleh ada spammers bah.. susah oo..
Daniel..i dont like spammers messing my page.. huhu..